"As home to the likes of Broadcast and Pram, Birmingham is an underappreciated hub of odd electronic music. Grandmaster Gareth is the unsung mastermind of this region. 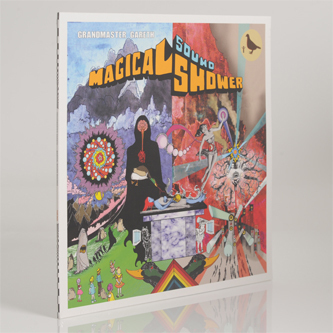 Declared “the new God” by John Peel, Gareth has recorded and performed with both aforementioned cult heroes of British electronic sounds, but has lain dormant as a solo artist for seven years, emerging now with his third solo LP ‘Magical Sound Shower’. Taking inspiration from B-movies, pulp sci-fi books, bee documentaries and an extraterrestrial state of being, ‘Magical Sound Shower’ sits alongside and builds upon its contemporaries, turning out nineteen tracks of space exotica – the soundtrack to a sci-fi movie that doesn’t exist or a modern day equivalent to Joe Meek’s ‘I Hear a New World’. In that there is no doubt. 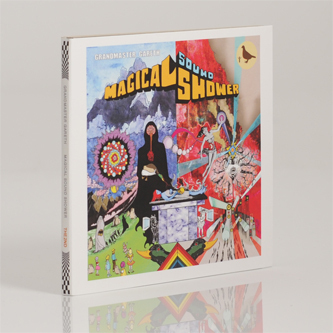 Regardless of whether you believe in a deity or not, ‘Magical Sound Shower’ is clearly the work of somebody creating their own universe – an escape from the big city, the sound of something otherworldly from a region slowly rebuilding itself from the rubble of the long-gone wealth of the industrial revolution. Grandmaster Gareth is the leader of cult 8-piece Misty’s Big Adventure, amongst his recording credits he has appeared with or been on production duties with Broadcast, Pram, Gruff Rhys, Jeffrey Lewis, and Kimya Dawson. He recorded a Peel session in 2003. He composed the music to Dave Gorman’s BBC2 series ‘Genius’. He is soon to be Artist-in Residence at Oxford University’s Astrophysics Department."